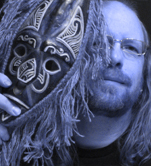 Don's Blog » Holidays Are Upon Us – Already! Holidays Are Upon Us – Already! As we enter into the holiday season I wanted to share some of the Christmas Cards I’ve created over the years. I’ve designed my own since 1983 when I was a raw 22 year old. You can get a sense of where I was each year in my life as you view the progression. From 1983 thru 1995 I used serigraphy (silkscreen) to create the card editions. Since 1996 they have been computer generated. In order to post them all in a format that was easy to view, I have posted them on my facebook Fan Page. I hope you enjoy. 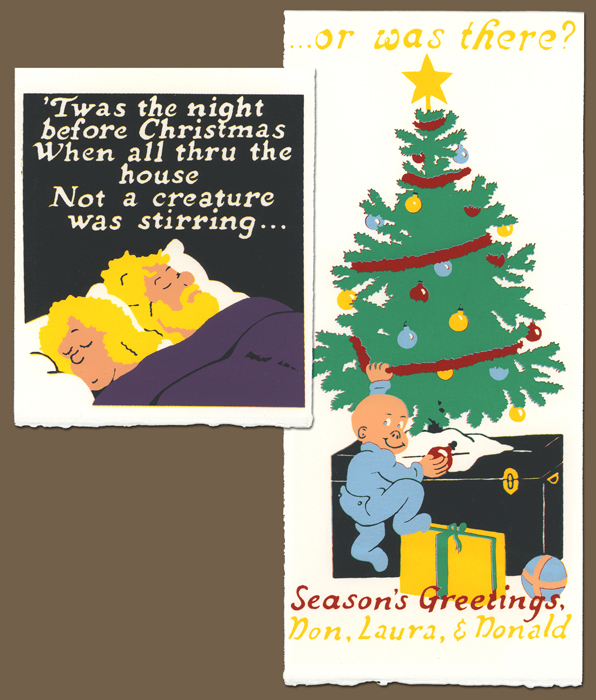 Our Oldest Son’s First Christmas – 1988 – Serigraphy editions of 70 & 10 – ©1988, Don Michael, Jr.
You have a lovely family! Your cards are wonderful – creative, warm, and full of personality! I hope the recipients have saved them all over the years – that would make a great collection. And, I was glad to see that in your most recent card you used masks. Thanks so much for sharing these, Don!